Here we present a protocol of whole-cell electrochemical experiments to study the contribution of proton transport to the rate of extracellular electron transport via the outer-membrane cytochromes complex in Shewanella oneidensis MR-1. Tokunou, Y., Hashimoto, K., Okamoto, A. Electrochemical Detection of Deuterium Kinetic Isotope Effect on Extracellular Electron Transport in Shewanella oneidensis MR-1. J. Vis. Exp. (134), e57584, doi:10.3791/57584 (2018). Direct electrochemical detection of c-type cytochrome complexes embedded in the bacterial outer membrane (outer membrane c-type cytochrome complexes; OM c-Cyts) has recently emerged as a novel whole-cell analytical method to characterize the bacterial electron transport from the respiratory chain to the cell exterior, referred to as the extracellular electron transport (EET). While the pathway and kinetics of the electron flow during the EET reaction have been investigated, a whole-cell electrochemical method to examine the impact of cation transport associated with EET has not yet been established. In the present study, an example of a biochemical technique to examine the deuterium kinetic isotope effect (KIE) on EET through OM c-Cyts using a model microbe, Shewanella oneidensis MR-1, is described. The KIE on the EET process can be obtained if the EET through OM c-Cyts acts as the rate-limiting step in the microbial current production. To that end, before the addition of D2O, the supernatant solution was replaced with fresh media containing a sufficient amount of the electron donor to support the rate of upstream metabolic reactions, and to remove the planktonic cells from a uniform monolayer biofilm on the working electrode. Alternative methods to confirm the rate-limiting step in microbial current production as EET through OM c-Cyts are also described. Our technique of a whole-cell electrochemical assay for investigating proton transport kinetics can be applied to other electroactive microbial strains. Electrochemical techniques to directly characterize a redox protein in an intact bacterial cell have recently emerged since the discovery of metal-reducing microbial strains, such as S. oneidensis MR-1 or Geobacter sulfurreducens PCA, which have outer membrane c-type cytochrome complexes (OM c-Cyts) exposed to the cell exterior1,2,3,4,5. The OM c-Cyts mediate electron transport from the respiratory chain to solid substrates located extracellularly. This transport is referred to as extracellular electron transport (EET)1,6 and is a critical process for emerging biotechnologies, such as microbial fuel cells6. Therefore, to understand the underlying EET kinetics and mechanisms, and its link to microbial physiology, OM c-Cyts have been investigated using whole-cell electrochemistry4,7, combined with microscopy8,9, spectroscopy10,11, and molecular biology2,4. In contrast, methods to investigate the impact of EET-associated cation transport, e.g., protons, on EET kinetics in living cells have been scarcely established, despite proton transport across bacterial membranes having a critical role in signaling, homeostasis, and energy production12,13,14. In the present study, we describe a technique to examine the impact of proton transport on EET kinetics in the S. oneidensis MR-1 cell using whole-cell electrochemical measurements, which requires the identification of the rate-limiting step in microbial current production15. One direct way to evaluate the contribution of proton transport on the associated EET is the deuterium kinetic isotope effect (KIE). The KIE is observable as the change in electron transfer kinetics upon the replacement of protons with deuterium ions, which represents the impact of proton transport on electron transfer kinetics16. The theory of KIE itself has been well established using electrochemical measurements with purified enzymes17. However, since current production in S. oneidensis MR-1 results from multiple, diverse, and fluctuating processes18, one cannot simply identify EET as the rate-limiting process. To observe the KIE on proton transport processes coupled with EET, we need to confirm that the microbial current production is limited by electron transport via OM c-Cyts to the electrode. For this purpose, we replaced the supernatant solution with fresh medium containing a high concentration of lactate as an electron donor at the optimal pH and temperature conditions before KIE measurement; this replacement served two roles: (1) it enhanced the rate of the upstream metabolic processes compared to the EET, and (2) omitted the swimming cells in the supernatant released from the monolayer biofilm of S. oneidensis MR-1 on the working electrode (indium tin-doped oxide (ITO) electrode). The presented detailed protocol is intended to help new practitioners maintain and confirm that the EET process is the rate-determining step. NOTE: To prevent the contamination of the electrochemical reactor with other microbes, all the media, implements, and components of the electrochemical reactor should be sterilized in advance. When using S. oneidensis MR-1 cells and constructing the electrochemical reactors, all the procedures should be conducted on a clean bench. NOTE: A monolayer biofilm of S. oneidensis MR-1 was formed on an ITO electrode following the conditions reported previously4. To grow S. oneidensis MR-1 cells, add one colony of S. oneidensis MR-1 grown on an agar plate comprising Luria-Bertani (LB) (20 g/L) and bacto agar (15 g/L) into 15 mL of LB medium (20 g/L) at 30 °C for 24 h in aerobic conditions with shaking at 160 rpm. Centrifuge the cell suspension at 6,000 × g for 10 min, and resuspend the resultant cell pellet in 15 mL of defined medium (pH 7.8) (DM: NaHCO3 [2.5 g/L], CaCl2·2H2O [0.08 g/L], NH4Cl [1.0 g/L], MgCl2·6H2O [0.2 g/L], NaCl [10 g/L], and 2-[4-(2-hydroxyethyl)-1-piperazinyl] ethanesulfonic acid [HEPES; 7.2 g/L]), supplemented with 10 mM lactate and 0.5 g/L yeast extract as the source of carbon, and trace elements for S. oneidensis MR-1, respectively. Further cultivate the cell suspension aerobically at 30 °C for 12 h with shaking at 160 rpm and centrifuge again at 6,000 × g for 10 min. Wash the resultant cell pellet twice with DM medium by centrifugation for 10 min at 6,000 × g before the electrochemical experiment. Put an ITO substrate as the working electrode at the bottom of the reactor. Subsequently, insert a glass cylinder (diameter of 2 cm) and a polytetrafluoroethylene (PTFE) cover. Then insert Ag/AgCl (KCl saturated) and a platinum wire into the reactor as the reference and counter electrodes, respectively. NOTE: To prevent the leakage of air and solution, insert a butyl rubber sheet between each component. Add 4.0 mL of DM supplemented with 10 mM lactate and 0.5 g/L yeast extract into the electrochemical reactor. 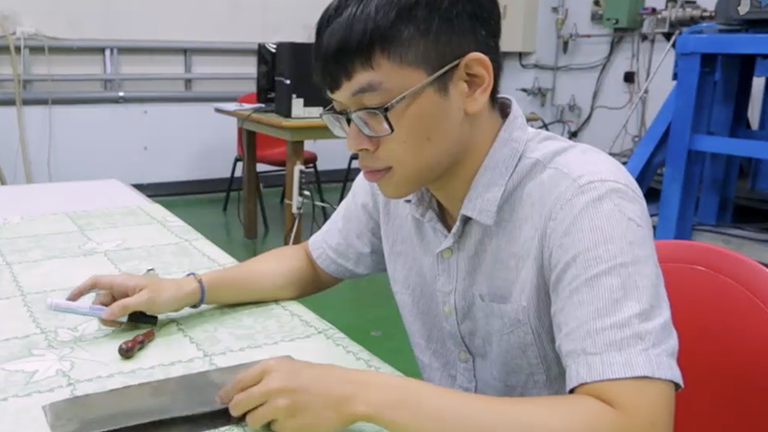 After confirming that there is no leakage from the electrochemical reactor, flow the nitrogen gas into the electrochemical reactor over 20 min to maintain anaerobic conditions inside the electrochemical reactor. NOTE: To prevent contamination with other microbes, the gas should be filtered before it flows into the electrochemical reactor. Connect the electrochemical reactor to a potentiostat and apply +0.4 V (versus standard hydrogen electrode, SHE) to the ITO electrode, keeping the temperature of the electrochemical reactor at 30 °C using an external water circulation system. NOTE: To prevent the effect of an external electric field, the electrochemical reactor should be placed in a Faraday cage. Adjust the cell density of the suspension obtained in step 1.1 to an optical density of 1.43 at 600 nm (OD600) with DM supplemented by 10 mM lactate and 0.5 g/L yeast extract. NOTE: To obtain the correct OD600, apply the cell suspension of OD600 ≤ 0.8 to a UV-vis spectrometer prior to adjusting the OD600 to 1.43. Add 0.3 mL of the cell suspension into the electrochemical reactor through the injection port using a syringe: the OD600 in the reactor changes to 0.1. NOTE: The addition of 0.3 mL cell suspension with OD600 = 1.43 into electrochemical reactor containing 4.0 mL medium results in 4.3 mL of solution with an OD600 = 0.1. When using other reactors with different volumes, the calculation of the cell density is required. 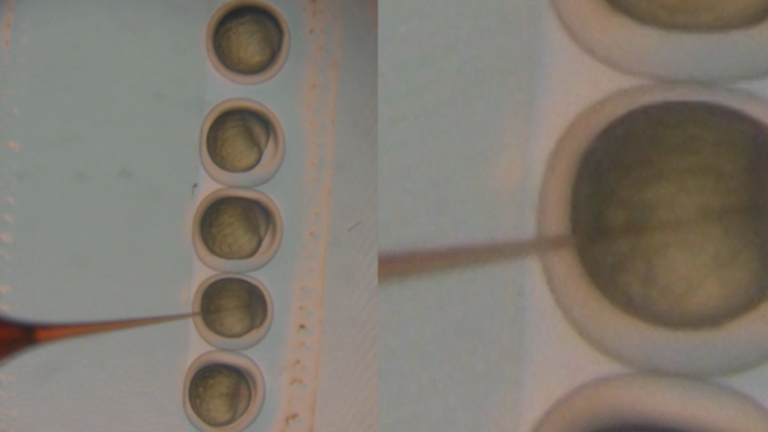 Continue the potential application at +0.4 V (versus SHE) to the ITO electrode for 25 h.
NOTE: For the formation of a monolayer biofilm on an ITO electrode, ensure that the produced current exhibits a deviation less than 50% from Figure 2. Stop the potential application and disconnect the electrochemical reactor from the potentiostat and the water circulation system. Flow the nitrogen gas into a bottle containing DM with 10 mM lactate over 20 min to remove oxygen from the medium. Slowly remove all the supernatant inside the electrochemical reactor using a syringe, under flowing nitrogen gas (Figure 3a, b). NOTE: To avoid breaking the biofilm on the ITO electrode by nitrogen gas, the gas should flow above the liquid surface. Add 4.0 mL of fresh DM containing 10 mM lactate using a syringe (Figure 3c). NOTE: To avoid breaking the biofilm on the ITO electrode, slowly inject the medium along the wall of the electrochemical reactor. To keep the biofilm wet, the medium should be added immediately after the removal of supernatant. 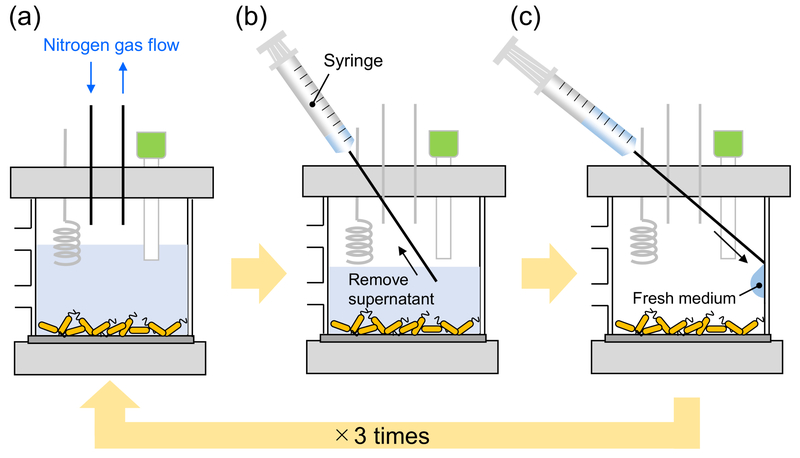 Injection of the medium upto 1 min after the removal of supernatant does not impact the current production from the biofilm of S. oneidensis MR-1. Slant the electrochemical reactor to remove all of the supernatant attached to the wall of the electrochemical reactor. Repeat the steps 2.2.2-2.2.4 three times in total. Stop the gas flow and connect the electrochemical reactor to the potentiostat again, applying +0.4 V (versus SHE) to the ITO electrode at 303 K.
Confirm that the current production from a monolayer biofilm of S. oneidensis MR-1 is stable and does not increase rapidly. If the current increases steeply, wait until the current stabilizes within a 5% increase over 10 min. NOTE: The formation of a monolayer biofilm on an ITO electrode without contamination of other microbial strains was confirmed by rDNA sequences and a scanning electron microscopic image of the biofilm on an ITO electrode, as reported previously4. For confirmation of the rate limitation by the EET process, monitor the effect of adding shuttling electron mediators such as 100 µM anthraquinone-1-sulfonate ( α-AQS). See the section of Representative Results and reference15 for further details. Add 40 µL of anoxic 50% (v/v) D2O into the electrochemical reactor using a syringe such that the concentration is 0.5% (v/v) D2O in the reactor. NOTE: To prevent damage to the biofilm by D2O addition, inject the D2O drop-wise. Wait for the current to stabilize, and subsequently add the D2O up to 4.0% (v/v). NOTE: To obtain the KIE value (the ratio of current production in the presence of D2O and H2O), check the effect of the same volume of H2O addition on the current production. After 25 h of potential application at +0.4 V (versus SHE), a monolayer biofilm was formed on the working electrode of ITO glass, which was previously confirmed by either a scanning electron microscopy or a confocal microscopy4. The representative time course of current production from the S. oneidensis MR-1 during the formation of a monolayer biofilm is shown in Figure 2. Although the current alters in every measurement, the produced current does not exhibit a deviation over 50% from the value in Figure 2 if a monolayer biofilm is uniformly formed. 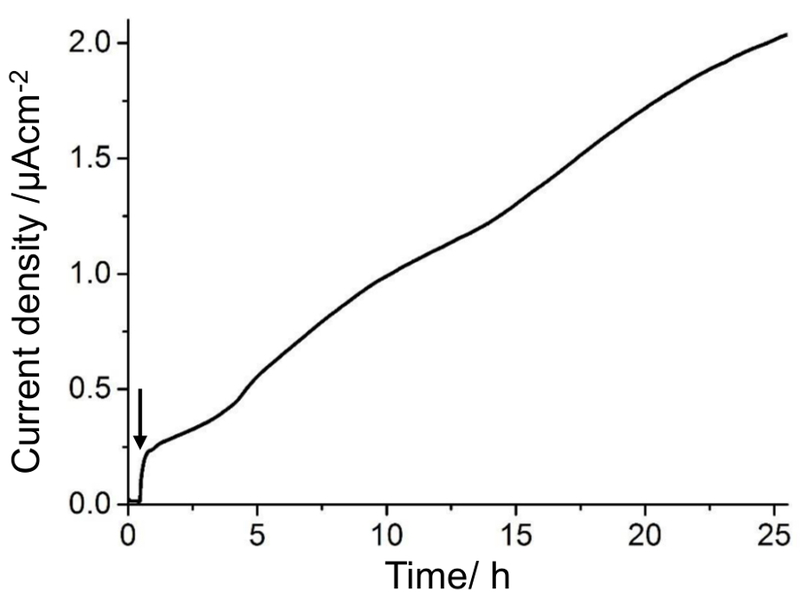 After replacement of the supernatant with fresh DM with 10 mM lactate to maximize the rate of metabolic processes and wash the monolayer biofilm (Figure 3), a stable anodic current (approximately 5% increase in 10 min) can be observed under +0.4 V (versus SHE) application (Figure 4a). If the anodic current increases steeply, wait until the current stabilizes. It is highly possible that the procedures for supernatant replacement described in Section 2 can damage the biofilm and reconstruction can occur. The solid line in Figure 4a is the representative result for the microbial current change induced by the D2O addition. The addition of 1.0% (v/v) D2O sharply decreased the microbial current within 10 s, while almost no current decrease was observed by the addition of H2O (dotted line in Figure 4a)15. The same tendency was reproduced in at least four separate experiments. The sequential addition of D2O at final concentrations ranging from 0.5% to 2.0% (v/v) clearly exhibited strong suppression in the current production (Figure 4a)15. Because the microbial current production gradually recovered likely due to the physiological effect19,20, KIE should be assigned to the current decrease soon after the addition of D2O. In a previous report, we collected the current production at approximately 10 min after the addition of D2O to calculate the value of KIE15. Using two methods, we confirmed that the observed current decrease by the D2O addition is attributable to the KIE on the EET through the OM c-Cyts complex. First, we added 1 µM riboflavin (RF) or flavin mononucleotide (FMN) into the electrochemical reactor before and after the D2O addition, which can be used to study EET in S. oneidensis MR-1.In the case of S. oneidensis MR-1, flavins specifically accelerate the EET process by binding with OM c-Cyts in a few seconds, because the flavins function as non-covalent binding cofactors21,22,23. Therefore, an instant anodic current increase by flavin addition indicates rate limitation by the EET process via OM c-Cyts (Figure 5). We further confirmed the effect of shuttling electron mediators on KIE. Small redox molecules, e.g., anthraquinone-1-sulfonate (α-AQS), terminate the EET process by diffusing from the microbial electron transport chain to the electrode, instead of direct electron transport via OM c-Cyts15,24. 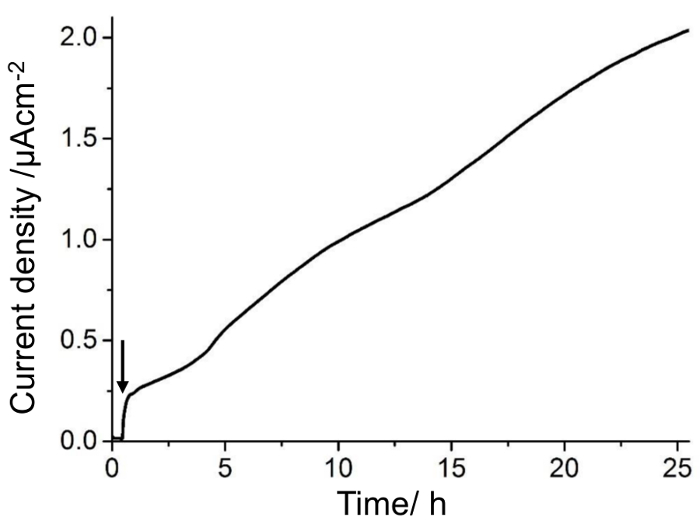 Here, the addition of 100 µM α-AQS enhanced the current production by more than 5-fold (Figure 4b), which indicates that the kinetics of the metabolic reactions are fast enough to make the EET process the rate-limiting step. Consistently, current production mediated by α-AQS remained unaffected by D2O addition (Figure 4b), demonstrating that the potential delay in metabolic reactions by D2O does not cause the large KIE observed in Figure 4a. The combination of these two approaches to observe the KIE on electron transport with OM c-Cyts is the critical point of this report, and specifically, shuttling electron mediators can be applicable to other electroactive biofilms. In addition, once we confirmed that the current change is assigned to the EET process, we could assess the effect of a partial deletion mutant of OM c-Cyts or of a flavin associated with OM c-Cyts on the proton transfer kinetics by comparing the KIE in both cases15. 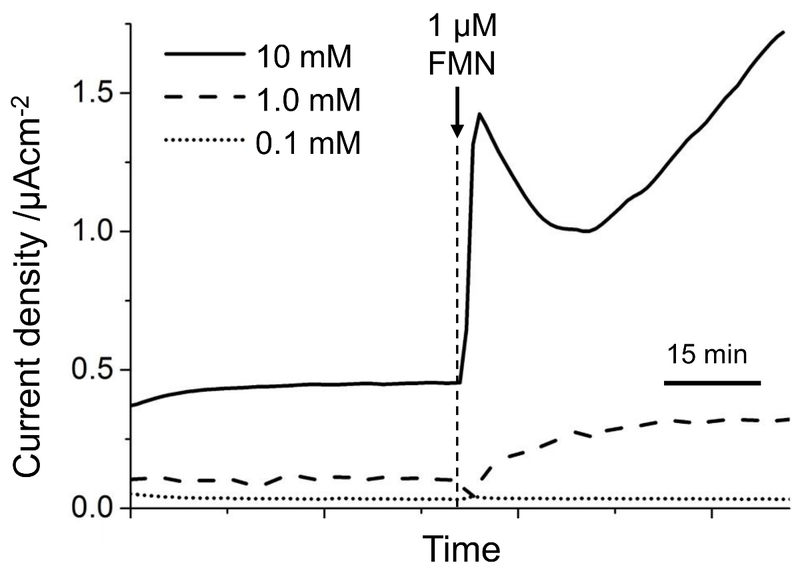 When D2O was added in the presence of FMN binding with OM c-Cyts, the current decrease was reduced such that it was smaller than that without FMN, indicating that the binding of FMN altered the proton transport pathway and its kinetics (Figure 4c)15. Figure 1: Electrochemical reactor used in this study. Photograph of the electrochemical cell before construction (a) and after construction (b). (c) Schematic illustration of the electrochemical reactor after 25 h of electrochemical inoculation at +0.4 V vs SHE. Please click here to view a larger version of this figure. Figure 2: Representative current production from S. oneidensis MR-1 during the monolayer biofilm formation on an ITO electrode. An arrow indicates the time of the addition of the cell suspension into the electrochemical reactor. The same tendency was reproduced in at least five individual experiments. Please click here to view a larger version of this figure. Figure 3: Replacement of the supernatant to fresh defined medium (DM) with 10 mM lactate. (a) Nitrogen gas flow above the liquid surface. (b) Removal of the supernatant from the electrochemical reactor. (c) Addition of 4.0 mL fresh DM containing 10 mM lactate. After the medium addition, the reactor should be slanted to remove the supernatant attached to the wall of the reactor. Conduct these procedure (a-c) three times in total. Please click here to view a larger version of this figure. Figure 4: Effect of D2O addition on the current production from a monolayer biofilm of S. oneidensis MR-1. 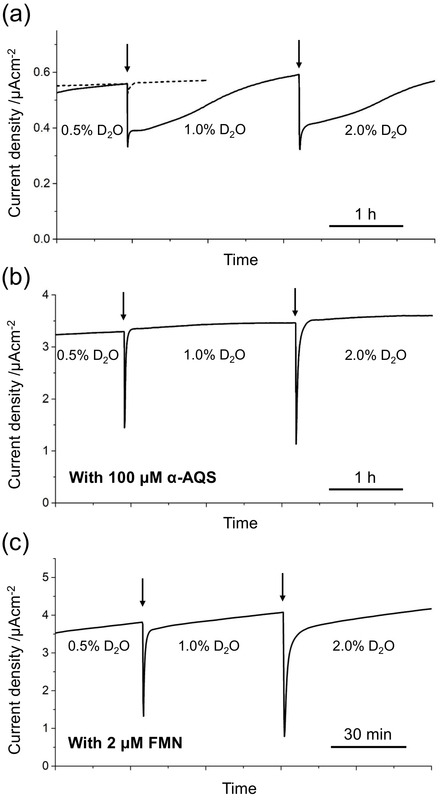 Time versus current production for a monolayer biofilm of S. oneidensis MR-1 in an electrochemical system containing 10 mM lactate (a), an additional 100 µM anthraquinone-1-sulfonate (α-AQS) (b), or an additional 2 µM flavin mononucleotide (FMN) (c). The same tendency was reproduced in at least four individual experiments. The arrows indicate the time of the addition of D2O (solid line) or H2O (dotted line). The data corresponding to the dotted line were normalized to the data point just prior to the addition of D2O in the solid line data. The concentration of D2O in the electrochemical reactor is indicated. Please click here to view a larger version of this figure. Figure 5: Assessment of the rate-determining step in the current production from a monolayer biofilm of S. oneidensis MR-1 by the addition of flavins. Time versus current production from a monolayer biofilm of S. oneidensis MR-1 in the presence of 10 mM lactate (solid line), 1.0 mM lactate (dashed line), and 0.1 mM lactate (dotted line). 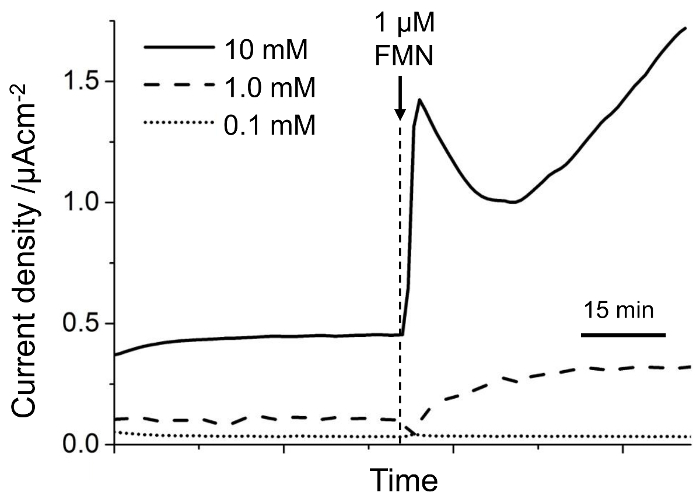 An arrow indicates the time point at which 1 µM flavin mononucleotide (FMN) was added into the electrochemical reactors. In the presence of 10 mM lactate, the addition of FMN drastically increased the current production, demonstrating that the extracellular electron transport (EET) through c-type cytochrome complexes embedded in the bacterial outer membrane (OM c-Cyts) is rate-determining. Less lactate concentration in the electrochemical reactor caused a smaller current enhancement by FMN addition, indicating that the electron supply from the upstream metabolic reactions to OM c-Cyts gradually became slower than the EET rate. The same tendency was reproduced in at least two individual experiments. Please click here to view a larger version of this figure. Our whole-cell electrochemical assay has several technical advantages compared with protein electrochemistry. While protein purification requires multi-step time-consuming procedures, our whole-cell method takes one day of self-organized biofilm formation after cell culture. To achieve a stable interaction between OM c-Cyts and the electrode, we need only sterilization and cleaning of the electrode surface; it does not require electrode modification for organizing the orientation of proteins4, e.g., S. oneidensis MR-1 intrinsically attaches onto the electrode, while orienting the OM c-Cyts in the same direction25,26,27. In contrast, the electrochemical reactions of proteins are sensitively affected by the distance between redox sites in the protein and the electrode; thus, the purified proteins must be carefully oriented28,29. More importantly, the whole-cell electrochemical assay directly characterizes OM c-Cyts complexes embedded in a lipid membrane with possible interactions with other membrane proteins, and so reflects the native proton management in the OM c-Cyts (this is often difficult to imitate using purified proteins). However, our technique has a limitation with respect to the concentration of D2O. High concentrations of D2O potentially slow down metabolic processes and growth19; therefore, we conducted the experiments using D2O concentrations that were less than 4% (v/v) in this protocol. In addition, because gene expression in microbes is regulated in a complex manner, small conditional differences might strongly affect the microbial phenotype and even the electron transport kinetics. In particular, the lactate concentration decreases during current production from the S. oneidensis MR-1 biofilm; therefore, it is important to conduct the KIE experiments before the rate-limiting process shifts to upstream metabolic reactions. The most critical point to successfully obtain the KIE is to clarify and confirm the condition in which the electron transport through OM c-Cyts limits the rate of current production monitored by the whole-cell electrochemical assay. In this protocol, we explain how to confirm that the rate of the EET limits and reflects the microbial current production. We introduced a combination of two methods; observation of the current change by flavin addition23, and D2O addition in the presence of a diffusing electron mediator, e.g., α-AQS15 (Figure 4 and Figure 5). If one cannot make the EET process rate-limiting, the most probable reason would be incomplete formation or physical detachment of the monolayer biofilm, or contamination by other microbes. We strongly recommend confirming the formation of the monolayer biofilm by scanning electron microscopy or confocal microscopy. It is highly possible that the medium replacement process damages the biofilm; therefore, the removal and injection of the medium should be conducted slowly, and nitrogen gas should flow above the liquid surface (Figure 3). If a uniform monolayer biofilm does not make the EET process rate-limiting, it is best to reexamine the medium components and measurement conditions, e.g., supplementation of lactate at a higher concentration than 10 mM, for further acceleration of upstream metabolic processes. These considerations are also important in other types of EET-capable microbes. Electron mediators can specifically be used to confirm that the EET process is rate-limiting in other types of EET-capable microbes including mixtures of bacterial strains; thus, we consider this protocol as a general method to investigate the kinetic impact of protons on direct electron transport at the bacteria/electrode interface. 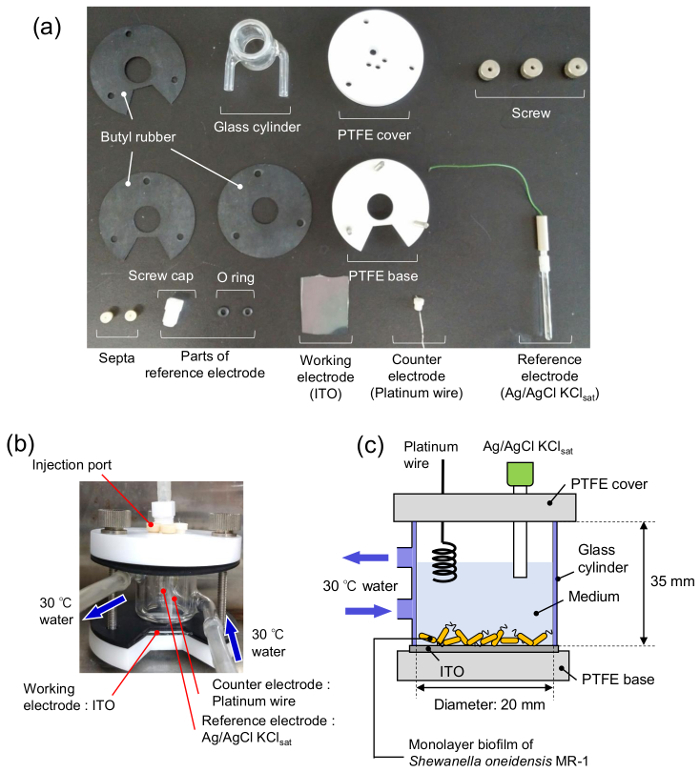 Considering that EET is observed in other microbial strains and consortia, as far as the EET process is rate-limiting, this protocol is applicable to study the microbial respiration in anaerobic iron corrosion and methane-oxidation processes as well as that in microbial fuel cells30,31. Our system of S. oneidensis MR-1 monolayer biofilm with the rate-limiting process of EET via OM c-Cyts can be used not only for the KIE experiments but also for the biochemical characterization of OM c-Cyts. For example, the addition of different concentrations of flavins that bind as cofactors to OM c-Cyts would permit the electrochemical quantification of the dissociation constant (Kd ~10 µM) for the formation of flavin-bound OM c-Cyts complexes32,33,34. Furthermore, our recent work demonstrated that the inverse electron backflow process via OM c-Cyts could be characterized through cathodic current production33,34. It has been proposed that the electron backflow is associated with proton import across the OM as a source for chemiosmotic ATP synthesis35; therefore, it is of great interest to examine the impact of protons on the electron backflow kinetics in OM c-Cyts. In conclusion, we developed techniques to examine the deuterium KIE on the EET through OM c-Cyts using living S. oneidensis MR-1. The technique can be used for characterization of OM c-Cyts as well as KIE observation, and it is potentially applicable to other electrogenic microbes. We believe that this methodology can be a general technique to investigate the EET directly via OM c-Cyts in vivo. This work was financially supported by a Grant-in-Aid for Specially Promoted Research from the Japan Society for Promotion of Science (JSPS) KAKENHI Grant Number 24000010, 17H04969, and JP17J02602, the US Office of Naval Research Global (N62909-17-1-2038). Y.T. is a JSPS Research Fellow and supported by JSPS through the Program for Leading Graduate Schools (MERIT). Nealson, K. H., Saffarini, D. Iron and Manganese in Anaerobic Respiration - Environmental Significance, Physiology, and Regulation. Annu. Rev. Microbiol. 48, 311-343 (1994). Bretschger, O., et al. Current production and metal oxide reduction by Shewanella oneidensis MR-1 wild type and mutants. Appl Environ Microb. 73, (21), 7003-7012 (2007). Richter, H., et al. Cyclic voltammetry of biofilms of wild type and mutant Geobacter sulfurreducens on fuel cell anodes indicates possible roles of OmcB, OmcZ, type IV pili, and protons in extracellular electron transfer. Energy Environ. Sci. 2, (5), 506-516 (2009). Okamoto, A., Nakamura, R., Hashimoto, K. In-vivo identification of direct electron transfer from Shewanella oneidensis MR-1 to electrodes via outer-membrane OmcA-MtrCAB protein complexes. Electrochim. Acta. 56, (16), 5526-5531 (2011). Strycharz, S. M., et al. Application of cyclic voltammetry to investigate enhanced catalytic current generation by biofilm-modified anodes of Geobacter sulfurreducens strain DL1 vs. variant strain KN400. Energy Environ. Sci. 4, (3), 896-913 (2011). Lovley, D. R. Bug juice: harvesting electricity with microorganisms. Nat. Rev. Microbiol. 4, (7), 497-508 (2006). Coursolle, D., Gralnick, J. A. Reconstruction of extracellular respiratory pathways for iron(III) reduction in Shewanella oneidensis strain MR-1. Front. Microbiol. 3, (2012). Franks, A. E., et al. Novel strategy for three-dimensional real-time imaging of microbial fuel cell communities: monitoring the inhibitory effects of proton accumulation within the anode biofilm. Energy Environ. Sci. 2, (1), 113-119 (2009). McLean, J. S., Ona, O. N., Majors, P. D. Correlated biofilm imaging, transport and metabolism measurements via combined nuclear magnetic resonance and confocal microscopy. ISME J. 2, (2), 121-131 (2008). Busalmen, J. P., Esteve-Nunez, A., Berna, A., Feliu, J. M. C-type cytochromes wire electricity-producing bacteria to electrodes. Angew. Chem. Int. Ed. 47, (26), 4874-4877 (2008). Nakamura, R., Ishii, K., Hashimoto, K. Electronic Absorption Spectra and Redox Properties of C Type Cytochromes in Living Microbes. Angew. Chem. Int. Ed. 48, (9), 1606-1608 (2009). Myers, C. R., Nealson, K. H. Respiration-Linked Proton Translocation Coupled to Anaerobic Reduction of Manganese(IV) and Iron(III) in Shewanella putrefaciens MR-1. J. Bacteriol. 172, (11), 6232-6238 (1990). Tokunou, Y., Hashimoto, K., Okamoto, A. Extracellular Electron Transport Scarcely Accumulates Proton Motive Force in Shewanella oneidensis MR-1. Bull. Chem. Soc. Jpn. 88, (5), 690-692 (2015). Okamoto, A., Tokunou, Y., Saito, J. Cation-limited kinetic model for microbial extracellular electron transport via an outer membrane cytochrome C complex. Biophysics and physicobiology. 13, 71-76 (2016). Okamoto, A., Tokunou, Y., Shafeer, K., Hashimoto, K. Proton Transport in the Outer-Membrane Flavocytochrome Complex Limits the Rate of Extracellular Electron Transport. Angew. Chem. Int. Ed. 56, 9082-9086 (2017). Hammes-Schiffer, S., Stuchebrukhov, A. A. Theory of Coupled Electron and Proton Transfer Reactions. Chem. Rev. 110, (12), 6939-6960 (2010). Cleland, W. W. The use of isotope effects to determine enzyme mechanisms. J Biol. Chem. 278, (52), 51975-51984 (2003). Kouzuma, A., Kasai, T., Hirose, A., Watanabe, K. Catabolic and regulatory systems in Shewanella oneidensis MR-1 involved in electricity generation in microbial fuel cells. Front. Microbiol. 6, (2015). Kushner, D. J., Baker, A., Dunstall, T. G. Pharmacological uses and perspectives of heavy water and deuterated compounds. Can. J Physiol. Pharm. 77, (2), 79-88 (1999). Xie, X. S., Zubarev, R. A. Effects of Low-Level Deuterium Enrichment on Bacterial Growth. Plos One. 9, (7), e102071 (2014). Okamoto, A., Hashimoto, K., Nealson, K. H., Nakamura, R. Rate enhancement of bacterial extracellular electron transport involves bound flavin semiquinones. Proc. Natl. Acad. Sci. U. S. A. 110, (19), 7856-7861 (2013). Edwards, M. J., et al. Redox Linked Flavin Sites in Extracellular Decaheme Proteins Involved in Microbe-Mineral Electron Transfer. Sci. Rep. 5, 11677 (2015). Saito, J., Hashimoto, K., Okamoto, A. Flavin as an Indicator of the Rate-Limiting Factor for Microbial Current Production in Shewanella oneidensis MR-1. Electrochim. Acta. 216, 261-265 (2016). Guo, J. B., et al. Reduction of Cr(VI) by Escherichia coli BL21 in the presence of redox mediators. Bioresource Technol. 123, 713-716 (2012). Nealson, K., Saffarini, D., Moser, D., Smith, M. J. A Spectrophotometric Method for Monitoring Tactic Responses of Bacteria under Anaerobic Conditions. J Microbiol. Meth. 20, (3), 211-218 (1994). Myers, C. R., Myers, J. M. Cell surface exposure of the outer membrane cytochromes of Shewanella oneidensis MR-1. Lett. Appl. Microbiol. 37, (3), 254-258 (2003). Lower, B. H., et al. Antibody Recognition Force Microscopy Shows that Outer Membrane Cytochromes OmcA and MtrC Are Expressed on the Exterior Surface of Shewanella oneidensis MR-1. Appl. Environ. Microbiol. 75, (9), 2931-2935 (2009). Chen, X. X., Ferrigno, R., Yang, J., Whitesides, G. A. Redox properties of cytochrome c adsorbed on self-assembled monolayers: A probe for protein conformation and orientation. Langmuir. 18, (18), 7009-7015 (2002). McMillan, D. G. G., et al. The impact of enzyme orientation and electrode topology on the catalytic activity of adsorbed redox enzymes. Electrochim. Acta. 110, 79-85 (2013). Dinh, H. T., et al. Iron corrosion by novel anaerobic microorganisms. Nature. 427, (6977), 829-832 (2004). McGlynn, S. E., Chadwick, G. L., Kempes, C. P., Orphan, V. J. Single cell activity reveals direct electron transfer in methanotrophic consortia. Nature. 526, (7574), 531-535 (2015). Okamoto, A., Nakamura, R., Nealson, K. H., Hashimoto, K. Bound Flavin Model Suggests Similar Electron-Transfer Mechanisms in Shewanella and Geobacter. Chemelectrochem. 1, (11), 1808-1812 (2014). Okamoto, A., Hashimoto, K., Nealson, K. H. Flavin Redox Bifurcation as a Mechanism for Controlling the Direction of Electron Flow during Extracellular Electron Transfer. Angew. Chem. Int. Ed. 53, (41), 10988-10991 (2014). Tokunou, Y., Hashimoto, K., Okamoto, A. Acceleration of Extracellular Electron Transfer by Alternative Redox-Active Molecules to Riboflavin for Outer-Membrane Cytochrome c of Shewanella oneidensis MR-1. J Phys. Chem. C. 120, (29), 16168-16173 (2016). Rowe, A. R., et al. Tracking electron uptake from a cathode into Shewanella cells: implications for generating maintenance energy from solid substrates. bioRxiv. 116475 (2017).